Update: This 13-inch device is quite real, or at least so says one source. CNET reported Thursday afternoon that it spoke with a source who said the laptop, dubbed the Vaio Duo 13, will make its official appearance during Sony's press conference at Computex next month. The source also backed up claims of the Windows 8 machine's specifications and it should come with customizable options including an i7 processor, 8GB of RAM and boosted SSD. There may also be a combo slot for SD and Memory Stick Duo storage cards. 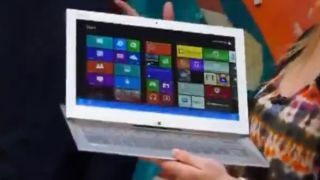 Sony's next Windows 8 laptop will be another twisty, slidy hybrid device according to evidence in this low quality video clip. The clip, which is apparently used for staff training at UK retailers PC World and Currys, shows off a 13-inch Ultrabook with a 1080p Triluminos touchscreen. The screen can be slid down over the keyboard to act as a tablet, or slipped back up and clicked into a standing position so you can use it as a traditional laptop - Sony is calling this the "SurfSlider design". The demonstrator picks up a stylus to mess about with Fresh Paint while using the laptop in tablet mode, rather ill-advisedly choosing yellow "paint" to show off. Other specs mentioned include ActiveSleep, 10 hours of battery life, NFC, a backlit keyboard, Clear Audio+, an 8MP Exmor RS camera sensor, Intel Core i5 processor, 4GB of RAM and a 128GB SSD. No clues as to a release date or price for the mystery laptop either - but it seems likely to make it to the UK at some point soon, at least.